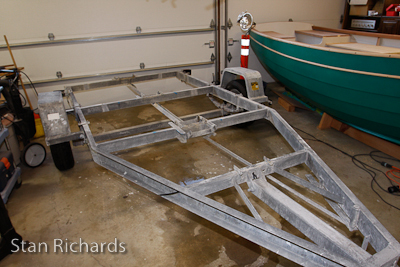 I was expecting to order a custom trailer that was ideal for Alice Gale (this is our boat’s name for the Ebihen 15). A few trailer manufacturers provided quotations and it looked like I would be spending upwards of $3500 for a trailer that would be ideal. For several months I would go online and browse Craig’s list for possible trailers that could be modified. I also have thought of making my own trailer. In late October Craig’s list came through with a trailer that was a perfect match for Alice Gale. I had a number of specific needs for the trailer. 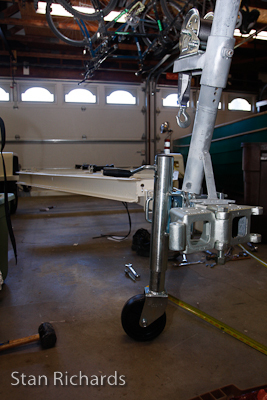 The trailer needed a folding tongue, low height, good balance, and solid support for the boat. This trailer is very unique. 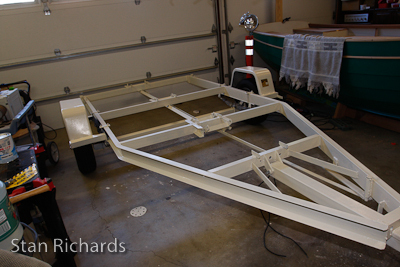 It has a tilt bed, adjustable keel rollers, adjustable axle location for balance, and a very long tongue that allowed me to adjust the overall trailer length to an exact size for my garage space. 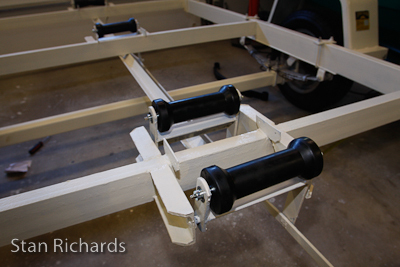 I am busy now with replacing the trailer springs, lighting, folding tongue, and adjusting the location and spacing of the winch assembly. 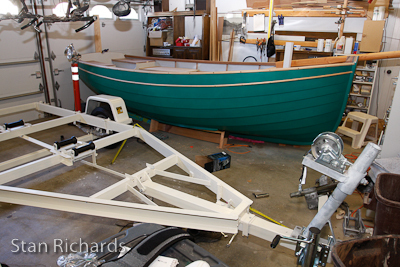 Once this is completed the trailer will be off to temporary storage while I get back to work on the boat. 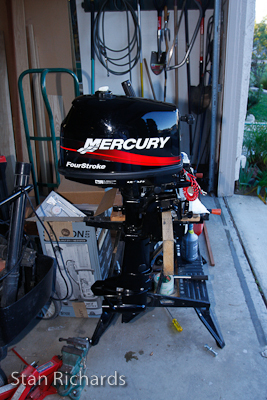 I scored again yesterday on Craig’s list with an 4HP Mercury outboard motor. Stan, Keep it up! The boat looks great, nice and fair lines! How is it going getting hardware. I hope to be assembling hardware kits for future customers. Would love to talk to you at some point when you are not so busy. So far all of my sailing hardware for the boat is coming from Classic Marine (UK) and Bosun Supplies. Sails and running gear yet to be ordered. The building supplies are from Glen-L Marine, West Marine, Forest Plywood, Home Depot, Crown Hardware, Grainger, Aircraft Spruce, Austin Hardwood, Schorr Metal, Reel Lumber, and Rockler. That is fantastic that you were able to find trailer and motor on Craigs. The paint job on the trailer really puts the icing on the cake. Looking forward to hearing more stories about the construction at the Lost Coyote party next month. Thanks for posting. I have followed every one. Thank you Jamie. This project has been extremely rewarding to me. I stepped beyond my comfort level from the start and it has been a great experience. Craig’s list has been my go to site this past year. I bought a number of power tools at the beginning of the build. I also sold a number if items too. My Harley, SeaDoo trailer, and 2 stroke outboard were sold on Craig’s list. Wow!! You have made great progress. I just reviewed you last few posts. I may want to move up the 3rd voyage status. It looks very seaworthy. Great job. We hope to have our cruise itinerary out soon. It’s people like you who ruin our economy. Buying all this stuff used. How does that stimulate anything? A new trailer built in China would have provided tons of jobs. Now all you’ve got to boast about is the fact that you did it yourself. Good Job! I helped out an internet company, “Trailer Parts Depot” with a few hundred dollars of replacement parts. I noticed most of the items where made in China.